Criminology and Criminal Justice describes and discusses criminology and criminal justice as social foci and as academic disciplines. Its comparative and contrasting nature allows readers to gain a better understanding of both topics as separate entities, but also how they are more intertwined than most might recognize. The book covers the most important aspects of these disciplines, beginning with laying the groundwork of nature and content and ending with a look into the future. At the book's conclusion, the reader should better understand the similarities and differences of the two, as well as recognize their singularly distinctive traits. Discussion questions are included at the end of each chapter to facilitate critical thinking. M.L. 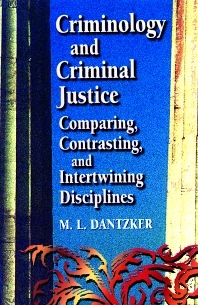 Dantzker is an associate professor of Political Science at Georgia Southern University teaching in the Justice Studies Program. He received his Ph.D. in Administration from the University of Texas-Arlington. Prior to entering academia full-time, Dr. Dantzker was a police officer in Indiana and in Texas. He has researched, consulted, and published in the areas of police stress, police job satisfaction, educational issues, criminal justice statistics, and police chief requirements.